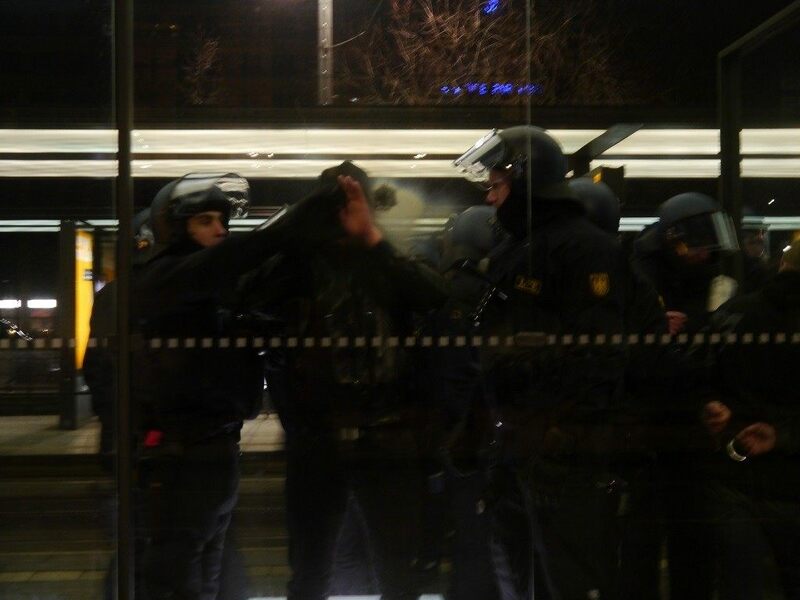 LEIPZIG, Germany – Wednesday night saw a flare of violence and an accompanying police operation on a scale without precedent in recent German history. A group opposing militant Islam in Europe has called a demonstration, the city is deafened by political slogans played over loudspeakers, property is vandalised, and explosives are thrown at police in colossal running battles that involve thousands of people. If you got your news from the mainstream media, what is increasingly known in Germany as the ‘liar press’ (Luegenpresse), the story might very well end there. Then again, the report might also throw in salacious details about the former leader of this movement and his colourful past, or the tragic death of an immigrant man who was killed shortly after a demonstration in Dresden last week. There is no doubt about what these reports are meant to leave you thinking. Germans actually taking pride in their country, and very soon after in the neighbourhood a young Eritrean is murdered with no apparent motive? Must be a racist attack. This has been a large part of the German establishment’s haughty dismissal of the Patriotic Europeans Against the Islamisation of the West (PEGIDA) group: that they are cold, angry racists with hatred in their hearts. The fact that many of the supporters appear to be middle class, grandparents, or young couples doesn’t matter. As one government minister remarked, they are merely “Pinstripe Nazis”. Nor does it matter that as was revealed on Wednesday, 20-year old Eritrean Khaled Idris Bahray was actually killed by his flat mate, rather than a roving band of politically engaged Germans protesting against government policy. The killing was reported in sensationalist tones last week by the British media. The Guardian claimed it “exposes racial tensions in Germany” and “anti-immigration sentiment”. Vice News said “Germany’s recent upsurge in anti-Islam sentiment appears to have taken a dark new turn”, and reported the flat mate’s fabricated version of events as fact, stating Khaled had gone to buy cigarettes and never returned. Despite the fact police have now recovered the murder weapon, that Khaled’s former flat-mate, a fellow Eritrean has confessed to the crime, and “significant” amounts of drugs are said to be involved, the story has been dropped like a hot stone by the English-speaking media. Two days after the confession, and you’d hardly know from the mainstream British press: clearly mud sticks in a country which is still apologising for the early 20th century. Outside the central railway station I meet a group of left wing school-age students. 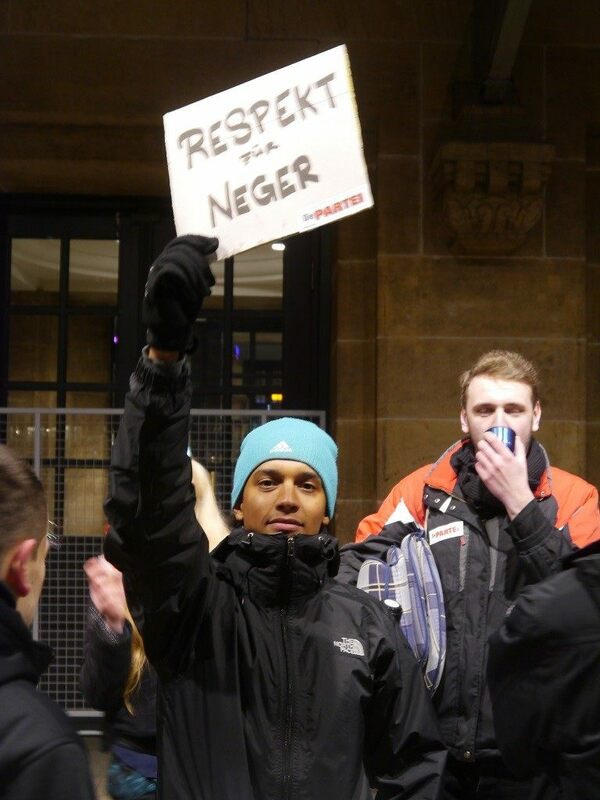 They are friendly, polite, and laugh about their journey to Leipzig, one of them carrying a sign that reads “Respect For Negroes”. When I ask them if they are concerned about the possibility of violence during the protest, the mood darkens. With complete sincerity one tells me they are desperate to fight PEGIDA and the police, remarking “we are ready”. It’s about this time, while large groups of PEGIDA supporters are being herded around by police trying to find routes around the blocking left-wing counter protestors, the mayor of Leipzig declared the city to be in a state of emergency. This is, after all, the largest police operation since the reunification of Germany. Upwards of 4,400 police officers are on duty and the entire route of the march is lined with police vans sitting nose-to-tail, creating a wall separating the stroll from the counter-demonstrators. At the rally itself the preoccupations of the supporters of the wider PEGIDA movement and the local Leipzig branch (‘LEGIDA’) are clear to see. What began last year as a movement opposing German involvement in foreign wars has become a revolt against the monolithic ‘grand coalition’ of German politics, in which a rush to the centre and mandatory multiculturalism is the order of the day, and all dissent is dismissed by the ‘Luegenpresse’ as nascent fascism. One very clear concern, which is evidenced by the proliferation of flags, signs, and speeches is the looming potential of war with Russia. Everyone I speak to articulates the view that German foreign policy is conducted in favour of the United States of America, rather than Germany or Europa, which is ultimately to the detriment of European people. Flags show half and half German and Russian stripes joined together in unity. One speaker calls for “peace with all nations from Lisbon to Vladivostok”. One man tells me “peace between Germany and Russia is our goal. But peace between Merkel [The German Chancellor] and Putin [The Russian President] is impossible”. 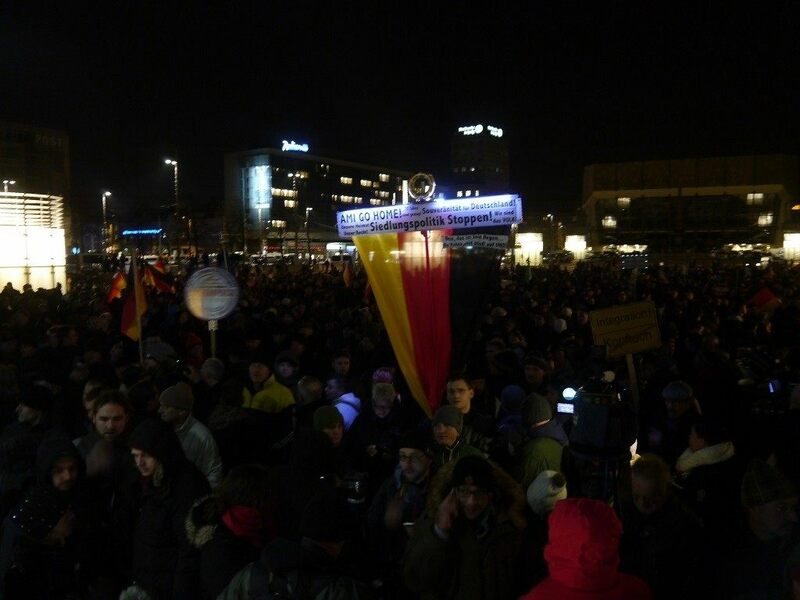 Once the speeches are over, covering all topics from the danger of radical Islam being allowed to develop unhindered in Europe, to the benefits of direct democracy, the march around Leipzig begins. What really strikes me is how remarkably quiet the PEGIDA strollers are. Some of them have learnt their art from their parents who opposed former Communist East Germany and Poland. Taking weekly ‘evening strolls’, the protesters of the 1980’s combined non-violent civil disobedience with conveniently being ‘out’ while the state-controlled evening news was showing on the television. 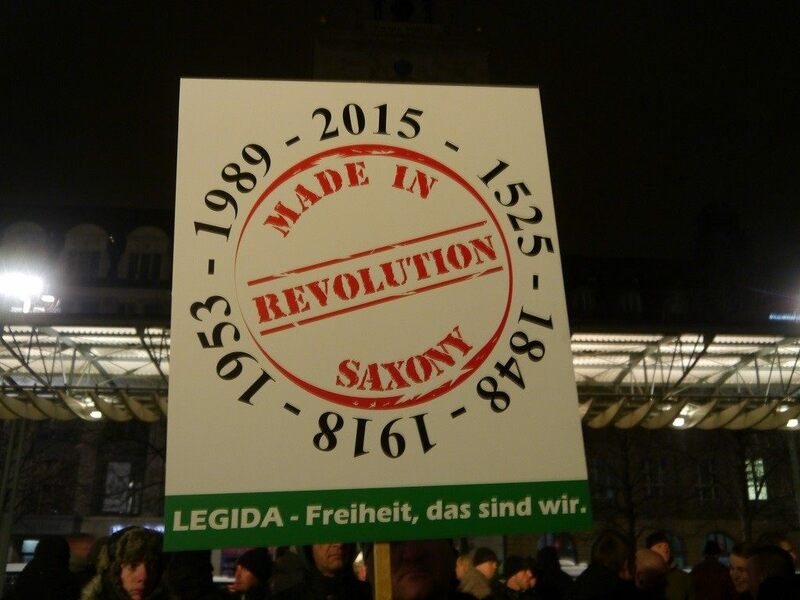 Others marching were veterans, clearly proud of the fact that Saxony, the state containing both Leipzig and Dresden has been at the forefront of German “revolutions” for centuries. The great column of people, twenty yards wide and half a mile long proceeds with a gentle hubbub of conversation between its participants. At times voices are raised, as the line passes a police command vehicle, one man shouts out in German “thank you police officers for protecting us”, and the column is moved to spontaneous applause. The strollers have good reason to be thankful. Every street that leads onto the route is packed with counter protesters pushing against the police lines. The entire stroll is punctuated with a regular din of exploding fireworks, deafening rave music, and left-wing slogans played over powerful sound systems. 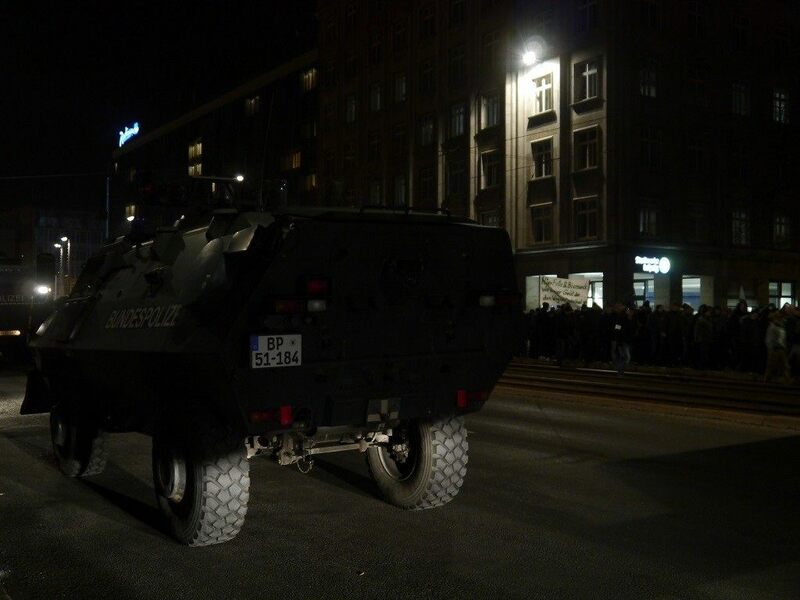 In addition to the regular police, there are a number of water-cannon and armoured cars stationed in the city. Dating from before German reunification, the ‘special vehicles’ of the Federal police are painted in dark green and are fitted with bulldozer blades, but their presence is not enough to deter trouble. 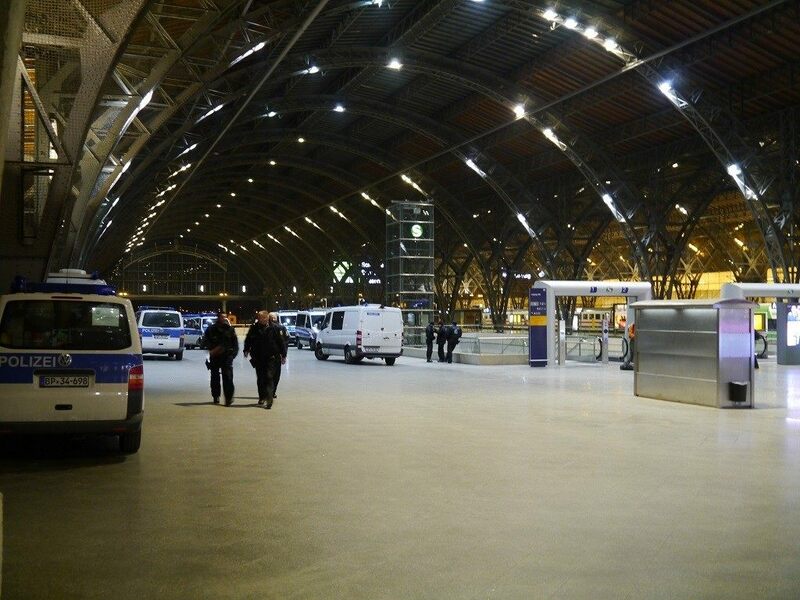 At the railway station after the protests have officially concluded the counter-demonstrators have given up trying to attack PEGIDA and instead are going directly for the police. I witness casualties lain out on the platforms of the tram station, the police searching and arresting dozens of young activists. A particularly large firework explodes outside the station just a dozen yards from where I am standing, and for a few moments the grand façade is shrouded in smoke. Later in the evening I speak to a group of police officers guarding the station and without hesitation one tells me all of the explosives and bottles thrown that evening were by the left-wing counter protesters. The next morning the newspapers are filled with discussions of the future of PEGIDA, and remarks that the numbers at the demonstrations were not as high as expected. 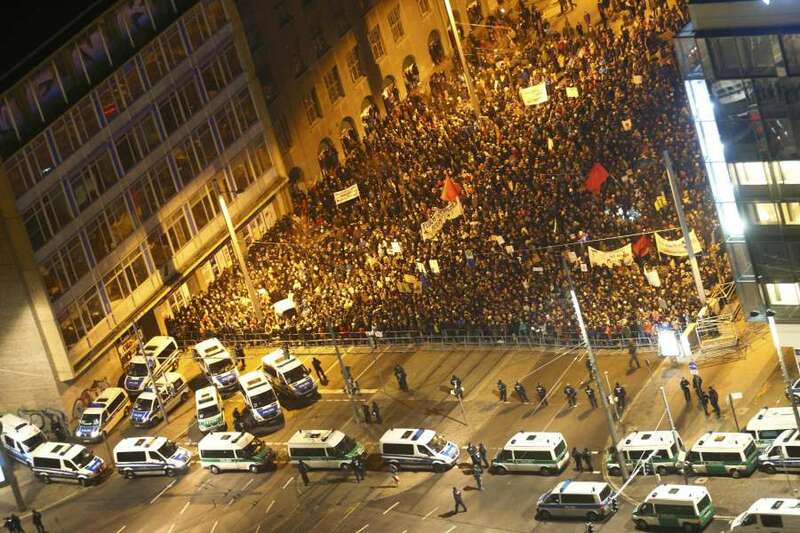 Though Leipzig city had estimated 100,000 could march on Wednesday, in total including all comers there were less than 40,000. 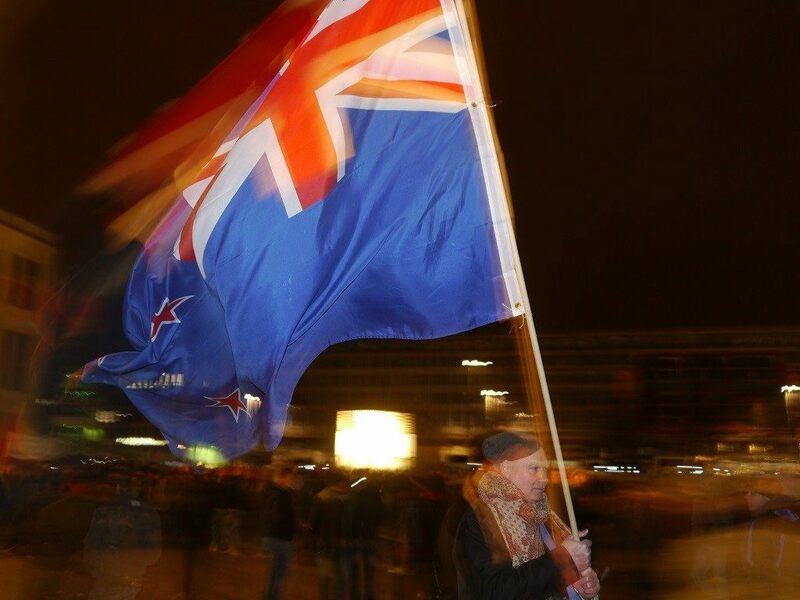 Wherever it goes now, in many respects PEGIDA has already served part of its purpose, in starting a debate on immigration, citizenship, and integration that has been silent for decades. Many people in Germany are questioning the post-war consensus that unlimited immigration and multiculturalism (or ghettoisation) is inevitable and desirable for the first time in their lives, and the freedom of thought bug appears to be spreading. 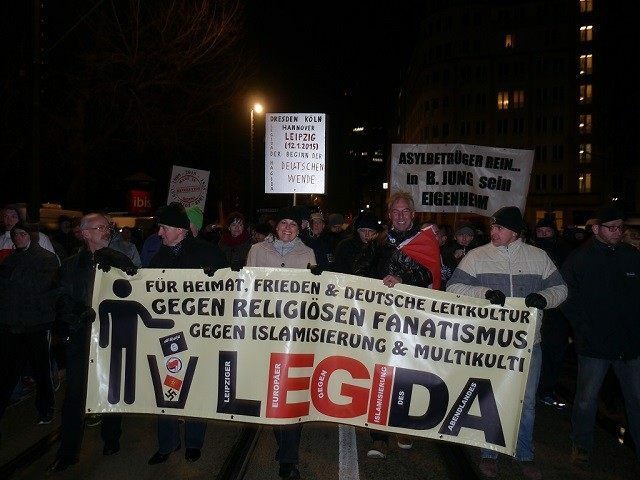 A PEGIDA march has even taken place as far away as Bulgaria, with movements planned in many European countries. Now PEGIDA seems set to come to the United Kingdom, Canada’s Globe and Mail asked yesterday whether Britain’s “Racial Tensions” would be tested by the first march which is set to hit a northern city in the next few weeks. In any case, if the PEGIDA movement can circumvent a German elite desperate to shut it down, and break through 50 years of silence perhaps it could even kick-start a new era of openness and discussion in Britain too.